Arc Condos are a new mixed-use development by Daniels Corporation, currently in the pre-construction phase at the corner of Erin Mills Parkway & Eglinton Avenue in northwest Mississauga. This new mixed-use development is part of the Daniels Erin Mills master planned community and will consist of a 19 storey building with 346 units and retail, commercial and office use space on the first three floors. Condo apartment prices start from the low $200,000’s. 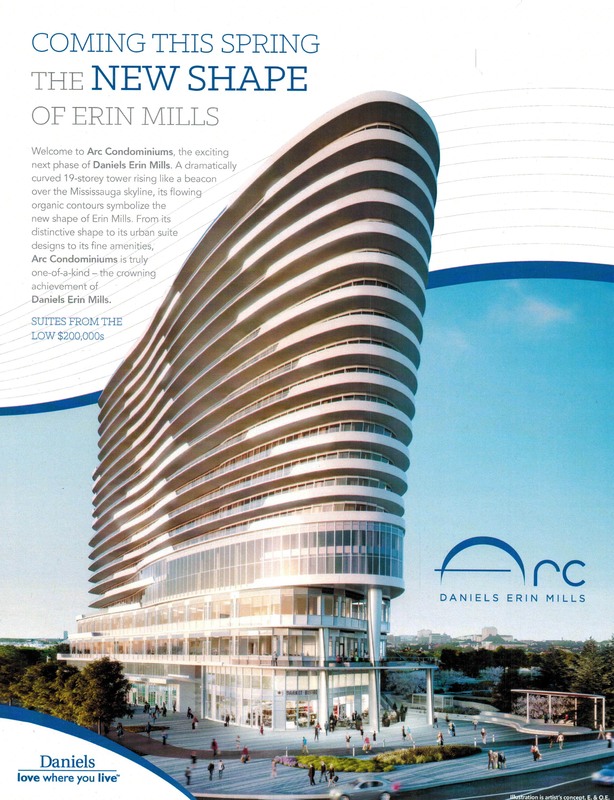 Arc Condos will be located at the southwest corner of Eglinton Avenue and Erin Mills Parkway, directly across from both the Credit Valley Hospital, and the recently updated Erin Mills Shopping Centre mall. As a mixed use development, the first three storeys of Arc are planned to have 6,546 square metres of retail, commercial and office use space. Architect for this project is Kirkor Architects of Toronto. 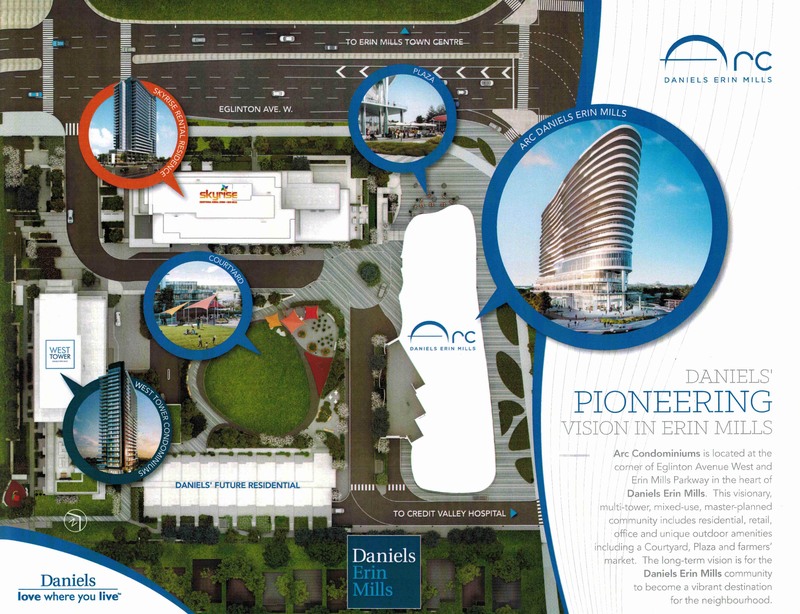 Arc Condos are the latest phase of the Daniels Erin Mills master planned community and is promising to add a very stylish, striking, curved structure to the neighbourhood. Earlier phases of the development include the West Tower condo, a 25 storey residential tower currently in the final stages of construction, plus the Skyrise Rental Residences which have also just been completed, featuring rental apartments. While the first two towers have more conventional highrise architecture, Arc will have an almost nautical arc-shaped design with billowing curves sweeping around all sides. Unit types range from small studio bachelors to large three-bedroom units with great views of the city and surrounding area, as far as Lake Ontario and the Niagara Escarpment. Arc features underground parking, a hotel-like lobby with concierge, and the overall master development also includes a community courtyard adjoining all the buildings. Amenities proposed include a full court gymnasium, a fitness centre with the latest cardio, weights, and aerobics equipment, open green space and a running track, and a weekly seasonal Farmer’s Market offering local, chemical-free produce. Arc Condominiums are one of the more stylish and interesting projects to hit the Mississauga new construction market, and will no doubt prove to be another success by Daniels Corporation. Arc has been covered by many major news sites, including the Huffington Post, as well as local realtors such as www.randyselzer.com . Pricing looks reasonable, and starts from the low $200,000’s.